When planning our January preschool theme (winter), I really wanted to do something with ice fishing - I knew it would catch the boys' attention. I ended up putting together a little ice fishing game that helps them practice letter and numeral recognition. intact as a matching card. Lots more great kid friendly ideas can also be found at these link parties: Link and Learn, Weekly Kid Co-op, Montessori Monday, Hip Homeschool Hop, Preschool Corner, For the Kids Fridays, and Show and Share Saturday. ICE FISHING!! This is so smart!! I am going to make one and ad it to my fishing themed prop box along with all my other fish games and activities. Thanks for sharing! My speech students are going to love this! They have gone fishing, but will love ice fishing with words with their sounds connected with a paperclip on the fish. New follower! Found you thru the hop :) Such a great fun idea!! Looking forward to following your blog! I have become a follower and look forward to reading your new posts. That's cute :) I would have loved that as a kid! oh wow! That is a great idea in so many ways! teaches everything!! I am your newest follower from the hop..pls follow back if you can! I've awarded your blog the Versatile Blogger Award! Stop by my blog to receive it! I use to love playing a fishing game as a child. I'm your newest follower from the hop and I am also a home school mommy of 2 preschoolers! thanks for this great blog with great ideas. You have the BEST craft ideas for your kids! This is something I am not so good at(but I want to be)!! Keep 'em coming! This is such a great idea and could be modified to practice so many different concepts! I like the idea of using the staples, they don't cover up so much of the fish and won't tangle or warp the fish over time. Love this idea! My daughter wants to go ice fishing for real, but this I can handle! 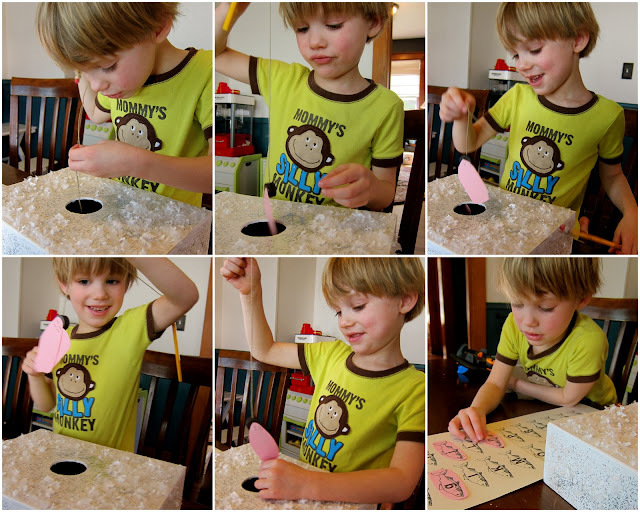 I really like the ice fishing aspect of this activity - great twist on an old favorite! Love this! I need to make one now too! Fabby idea and just what we need for our winter and letter of the week work! Thanks for the ideas!! I've done a very similar activity before with farm animals but I love how this has a real "game" aspect. I'm definitely going to try it. Thanks for the idea. Hello.This article was extremely fascinating, particularly since I was investigating for thoughts on this issue last Sunday. This is so cute! I'm thinking of doing a polar unit with my kids and this would be a great way to work on letter or number recognition while keeping with the polar theme! I am giving this a try. This is such a creative idea will use for an art project in February teaching about fresh water fish and history of ice fishing!